This Cumberland-type fluted point was the first of six fluted points recovered from the complex of caves located on lookout Mountain in Orange County, New York. The escarpment rises 260 feet above a post-glacial lake of the terminal Wisconsin period. Originally excavated by the Orange County Chapter in 1965-67, the area is now a registered National Historic Landmark. This point is fully fluted on both faces and is ground smooth on the lower edges and base. It is skillfully fashioned of Kalkberg chert and the edges have been expertly retouched. The point was covered on both faces by white lime crust, one side of which was removed for photography. This crust is due to the location of the caves in a formation of dolomitic limestone of the Ordovician period. This Cumberland-type point was recovered well outside the usual geographic range of the type and very rare in this region where the Clovis-type predominates. 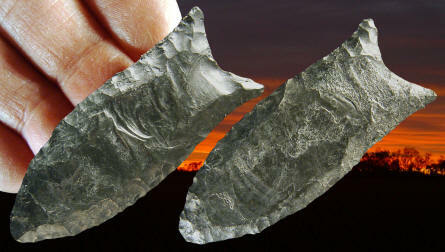 This is a cast of the first fluted point reported from a northeastern cave or rockshelter. It measures 2 5/16 inches long.